An A-frame house owned and restored by Nicky Panicci in the Hollywood Hills. It is a striking example of an architectural A-frame. An A-frame house is an architectural house style featuring steeply-angled sides (roofline) that usually begin at or near the foundation line, and meet at the top in the shape of the letter A. An A-frame ceiling can be open to the top rafters. Although the triangle shape of the A-frame has been present throughout history, it surged in popularity around the world from roughly the mid-1950s through the 1970s. It was during the post–World War II era that the A-frame acquired its most defining characteristics. A-frame buildings are an old form known in Europe, China, and the South Pacific islands sometimes called a roof hut and were simple structures used for utilitarian purposes until the 1930s. In 1934, R.M. Schindler built the first modern A-frame house, for owner Gisela Bennati, in Lake Arrowhead, California. Architects Walter Reemelin, John Campbell, George Rockrise, Henrik H Bull, and Andrew Geller helped to popularize Schindler's idea in the early 1950s, designing A-frame vacation homes. 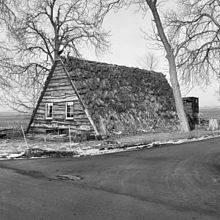 In 1955, Andrew Geller built an A-frame house on the beach in Long Island, New York, known as the Elizabeth Reese House. Geller's design won international attention when it was featured in The New York Times on May 5, 1957. Before long, thousands of A-frame homes were being built around the world. The Abbey Resort in Fontana-on-Geneva Lake, Wisconsin claims to have the world's tallest wooden A-frame. The post–World War II popularity of the A-frame has been attributed to a combination of factors including Americans' extra disposable income, the inexpensiveness of building an A-frame structure, and a new interest in acquiring a second home for vacationing. Another factor contributing to the rise of the A-frame included the adaptability of the structure itself, which enabled architects to experiment with more and more modern designs. A-frames were a useful medium in which architects could explore their creative side since they were relatively cheap to build. Additionally, many people preferred the idea of a "modern-style" vacation home to that of a "modern-style" primary home. A-frames became available as prefabricated kits, lowering the cost even more, and were sold by Macy's department stores. After the rise of the archetypal A-frame, architects soon began experimenting with new designs, which led to what became known as the modified A-frame style. ^ a b c d Randl, Chad. A-frame. New York: Princeton Architectural Press, 2004. Print. ^ "The (R.M.) Schindler List". Archived from the original on 2016-09-26. Retrieved 2017-12-19. Wikimedia Commons has media related to A-frame buildings. A-frame House Website (archive) about an a-frame house located in Phoenix, AZ.